Keep residents in the loop by sending notices, announcements and newsletters through email and our modern resident portal. 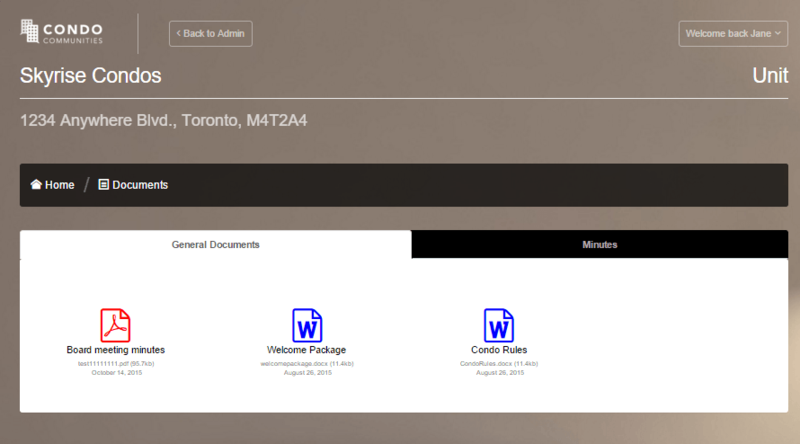 Upload important building documents such as by-laws, board minutes and more for residents to be able to download. Unlimited storage space. Keep the condo community vibrant. Post events to the community calendar. Allow residents to submit their service requests online. The system will create a record of the issue and track the communication until it's been resolved. 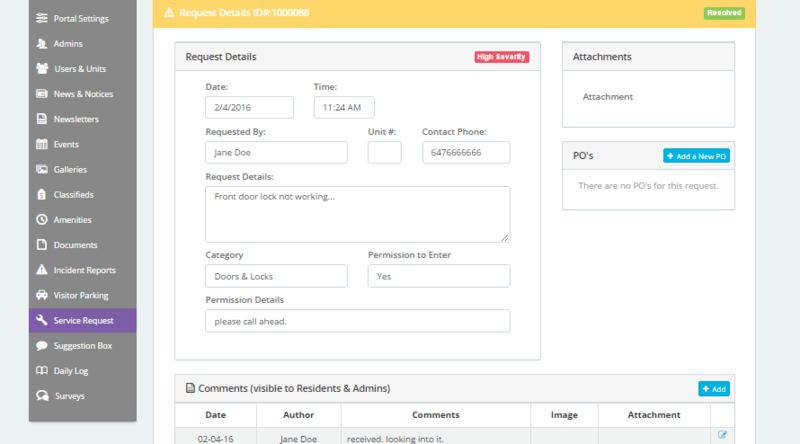 Manage all amenity bookings electronically. Eliminate cash and cheques. The system allows for credit card payments. Looking to rent out your parking spot in the building? Post it to the buildings' classified section. Create surveys and polls for residents. All results are tallied electronically. Residents can submit suggestions directly to property management through the resident portal. Board Members are able to quickly approve any type of document, proposal or anything else that needs approval by simply logging in. 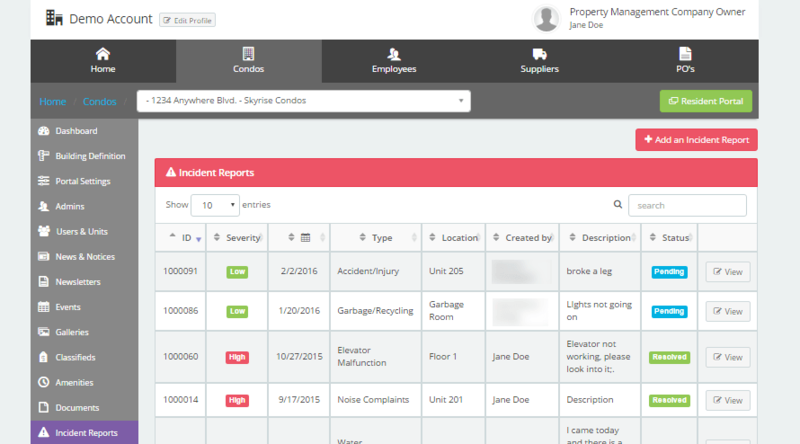 Keep an organized record of all incidents reported in the building. 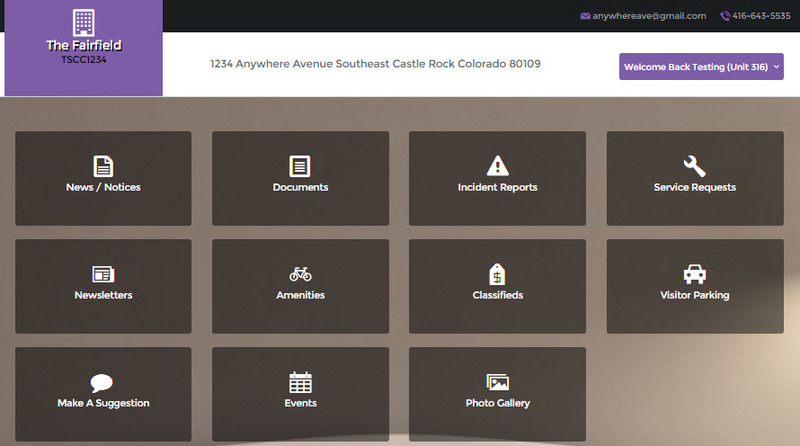 Residents can submit incident reports directly to property management. Know everything about your on-site residents and off-site owners. The resident registry will store everything from emergency contacts to vehicle information and much more. Keep track of packages/deliveries arriving at your concierge. Inform residents of their delivery via email. Security can keep detailed records of all activities that have occurred in the building on a daily, monthly or yearly basis. Front desk staff and residents can create different types of visitor parking permits. Residents can issue their own visitor parking permits for their guests based on the number of permits they are allotted per month. 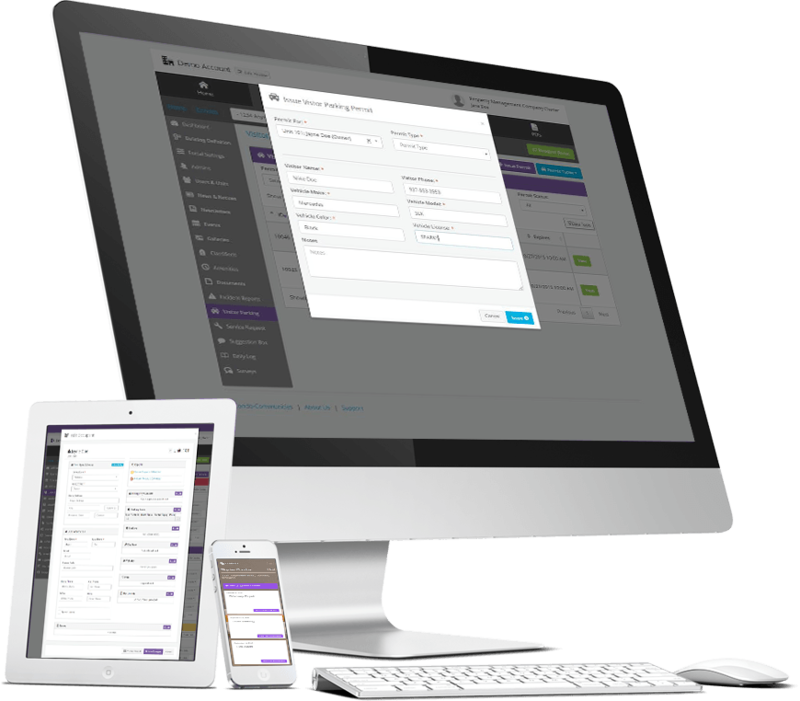 Quickly place purchase orders with suppliers and contractors through our Purchase Order (PO) Management module. 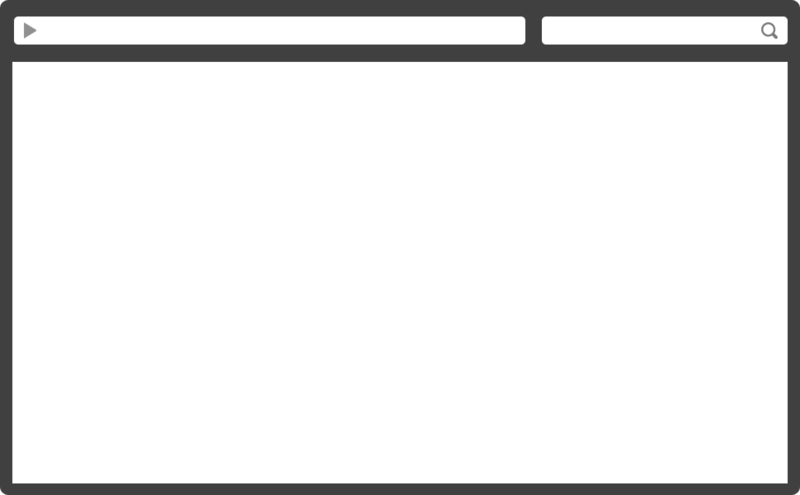 To save you time and spare you a lot of hassle, the module will track all the orders on your behalf and notify you when a supplier accepts or declines an order. The registry allows you to search your preferred suppliers contact information quickly and easily. CondoCommunities.com has integrated with QuickBooks Online which allows two-way communication as well as showing resident account balances. Inquire within. CondoCommunities.com is a tech software company operating out of Toronto, Canada, developing resident and management portals unique to the condo management industry. CondoCommunities.com was founded in 2001, we can proudly say we were the first to recognize the need for a condominium management website geared towards residents, managers and the property management industry. 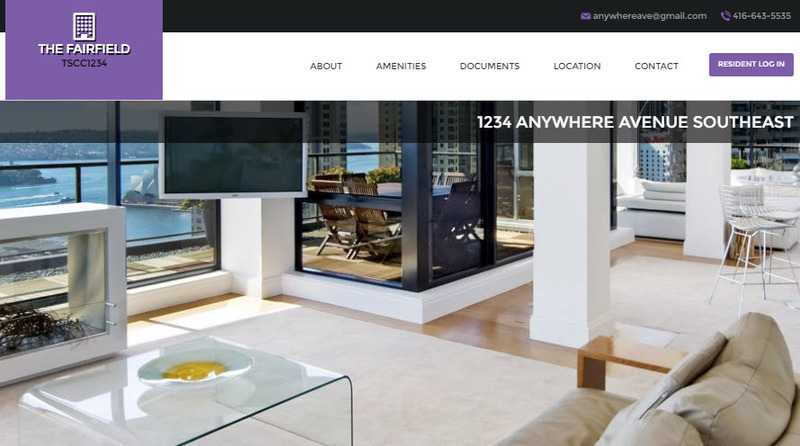 We are a unique team of property management veterans with extensive experience in condo management, our goal is to create the best, most innovative community websites for condos around the world. CondoCommunities.com supplies condos, boards and management companies with the software tools needed to make the most of their condos on the internet. 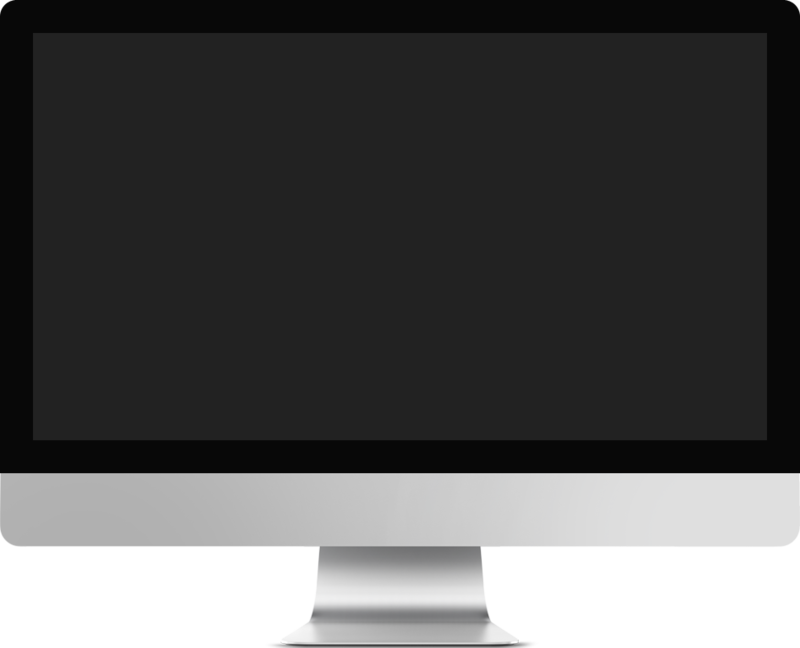 Our programmers and designers work closely with property managers, boards and residents to create websites and software that are practical and easy to use. Our real-world experiences combine with the best technologies available to create the best condo portals and management software available. We work side-by-side with prominent names in tech to evolve our software, we make improvements as usage and learning patterns emerge and new technologies become available. 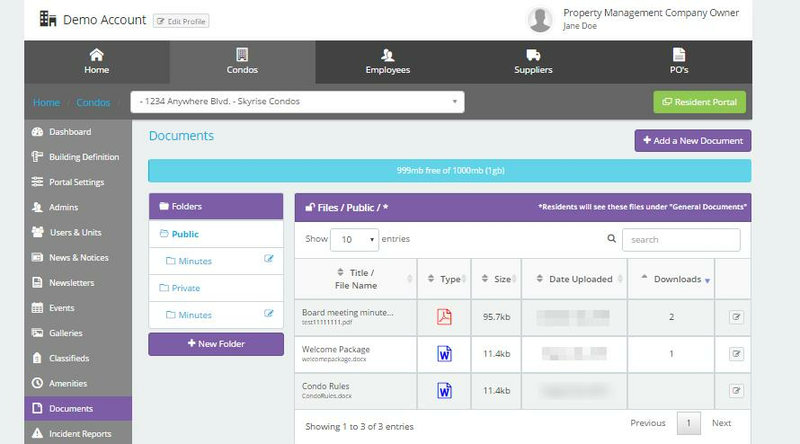 CondoCommunities.com provides infrastructure components that property management companies use in their day to day operations. These include comprehensive resident database services, purchase order tracking, status certificate creation, suppliers lists, communications tools and much more. Since our founding, CondoCommunities.com has partnered with some of the largest property management companies to deliver ground breaking on-line web portals for their condos. 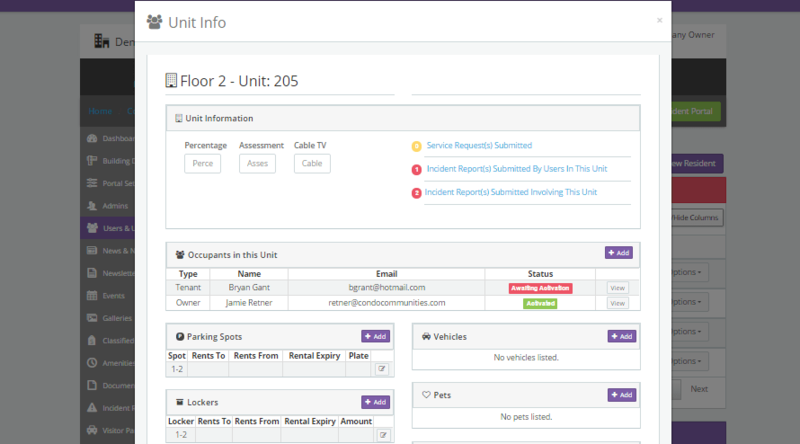 I’ve worked with your product now for many years, and I have never worked with a condo management platform which is as simple to use and just runs year after year after year. 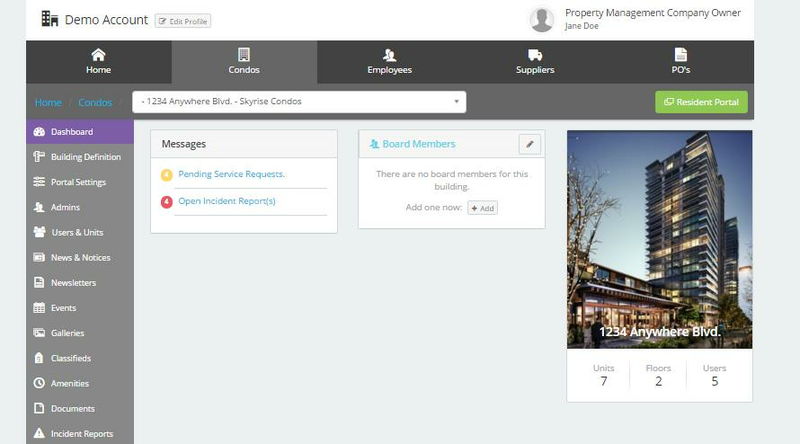 With CondoCommunities.com I can provide my residents and board members with no-fuss access to all the features. The software has made our building run more efficiently. We couldn't be happier! CondoCommunities.com has allowed our building to gain control of the communication challenges we were facing...it is very easy to use and understand. 2019© Copyright condocommunities.com All rights Reserved.